It’s easy to see why pastel is such a popular spring colour trend. Soft, understated colours like pale pink, lilac and powdery light blue instantly bring happiness to any outfit. You might think that these Easter inspired shades could be tricky to pair together, but with a few simple style tips from us, you’ll be pasteling (did we just invent a word?) like a pro in no time! 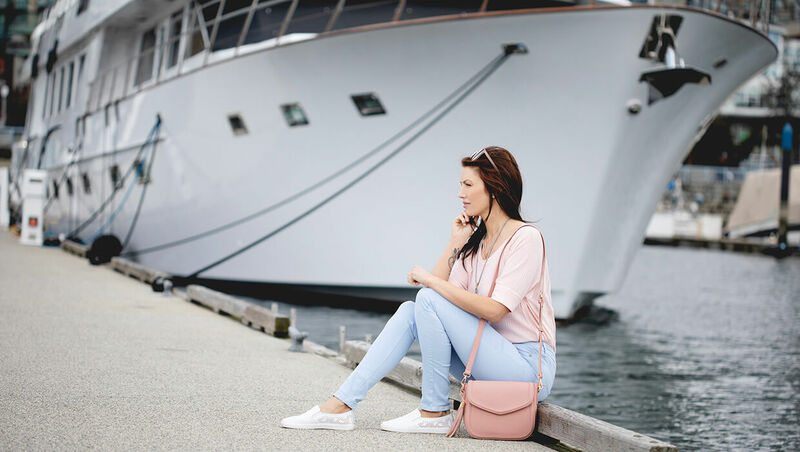 Get the Look: Julia is wearing the All Dolled Up Top (Blush, S), World Class Denim (Light Blue, 4), One Step Ahead Sneakers (White, 38), All Around Town Handbag (Rose Pink). Fashion tip – mix pastels! Soft, subtle shades pair unexpectedly well together. These cotton candy-like colours complement each other, creating a cohesive, feminine look. 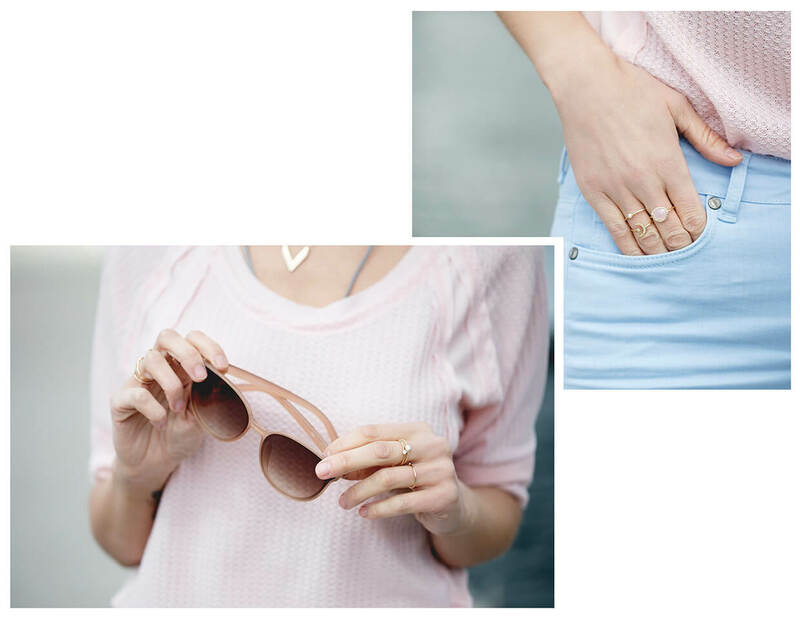 Get the Look: Julia is wearing the All Dolled Up Top (Blush, S), World Class Denim (Light Blue, 4), Opal of My Eye Ring (Gold), Fly Me to the Moon Ring (Gold). Keep your eyes peeled for sneak peeks of items that will be going on presale soon! When done right, pastels can create a gorgeous, shabby-chic or mermaid-inspired colour palette. Dress your look up by adding your favourite jewelry. Delicate pieces create an elegant look and pair perfectly with soft shades. Get the Look: Julia is wearing the All Dolled Up Top (Blush, S), World Class Denim (Light Blue, 4), Opal of My Eye Ring (Gold). We’re a big fan of stripes, especially this gorgeous pastel turquoise striped top. Pastels and white is a match made in heaven, so naturally we love the way this top looks with white shorts. Adding some white to your outfit also can add some separation, when you’re featuring multiple pastel colours in your outfit. Don’t be afraid to mix warmer cream shades with white or pastel either. Get the Look: Julia is wearing the Living Colour Top (Turquoise and White Stripes, S). Keep your eyes peeled for sneak peeks of an item that will be going on presale soon! Pastels are uplifting and bubbly. Not too loud, these cool tones look great against a pair of fresh white denim. When going for a more polished look, add accessories and a neutral coloured flat, such as the Poised for Success Shoes. 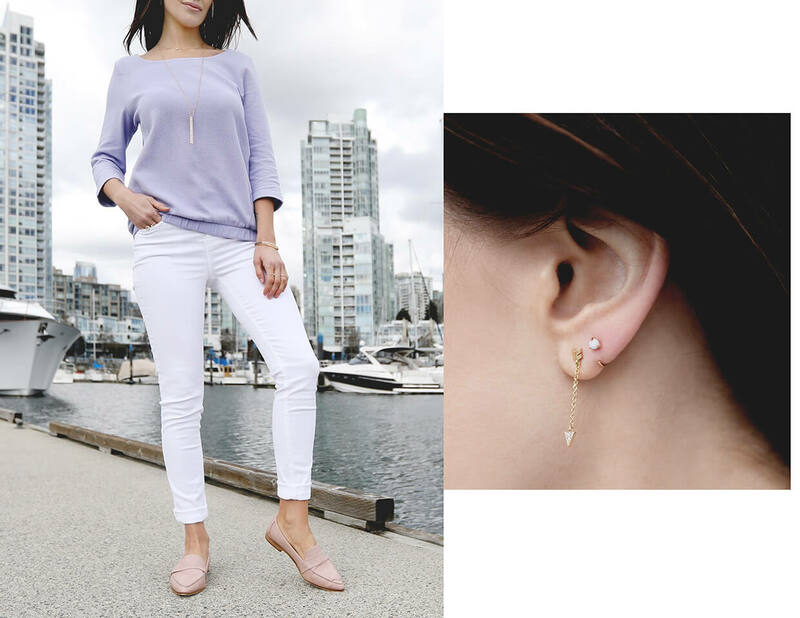 Get the Look: Julia is wearing the She’s All That Top (Soft Violet, S), World Class Denim (White, 4), Raising the Bar Necklace (Ivory and Gold), Aim for the Top Earrings (Gold), Poised for Success Shoes (Blush, 8), Stay Humble Bracelet (Silver and Gold). Keep your eyes peeled for sneak peeks of an item that will be going on presale soon! Soft violet colours like this one give off such a gentle, ladylike vibe. Perfect for springtime and Easter, the She’s All That Top looks fabulous with elegant jewelry. 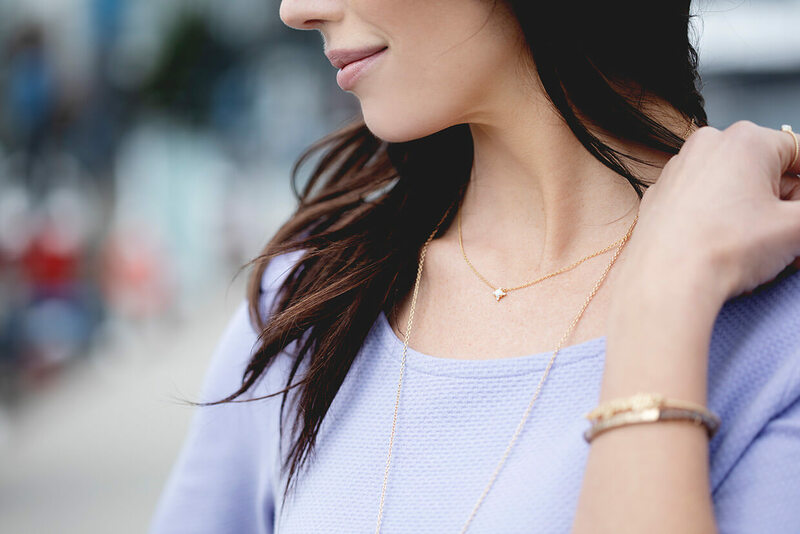 To create a sophisticated look, try layering delicate golds. Get the Look: Julia is wearing the She’s All That Top (Soft Violet, S), World Class Denim (White, 4), Light the Way Necklace (Gold), Stay Humble Bracelet (Silver and Gold). Pastel colours are extremely versatile. Sport these beautiful, soft hues anywhere from work to a yoga class. Soft shades look great on all body shapes and heights and can create a highly sought-after look. So go ahead and hop on the pastel trend, just in time for spring! Get the Look: Julia is wearing the She’s All That Top (Soft Violet, S), World Class Denim (White, 4), Poised for Success Shoes (Blush, 8).